UK SMEs are gearing up for a new future of international post-Brexit trade with various coping mechanisms including trading more outside Europe and looking to explore new markets. The start of 2018 saw a slight uptick in the value of international trades made by UK SMEs, with an average monthly trade value of £48,000. This is the second highest figure on record and 20% higher compared to the same period last year. In another reversal of 2017 trends, UK SMEs have returned to hedging protection across most major currencies. 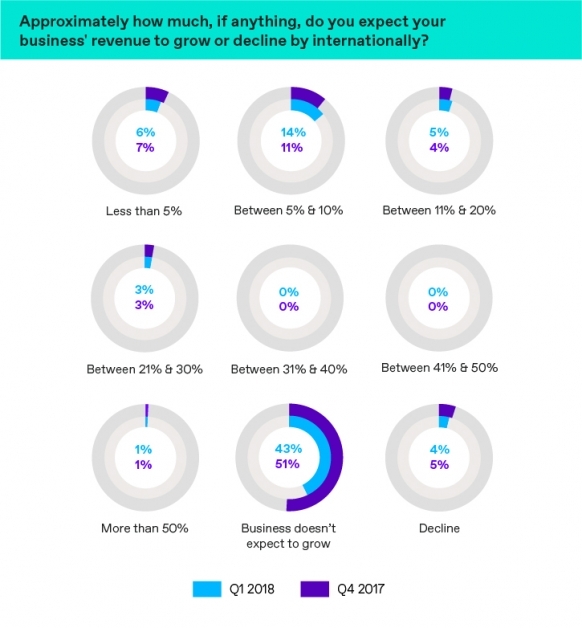 This is the biggest indication that SMEs are planning for increased international trade over the next quarter as they try to manage their currency exposure. The only declines in hedge contracts booked were with the Australian Dollar and the Swiss Franc, with the Australian Dollar seeing its second consecutive decline in hedges booked. Despite the number of SMEs trading internationally remaining stagnant since the start of 2017, the average value of trades has steadily increased to £47,750 – the second highest value on record. The percentage of SMEs making an international transaction in an average month stayed steady at 26% for the second month running. This represents a decline of 2% from the same period in 2017 and 10% when compared to 2016. Small businesses are also making more international trades – an average of 13 trades a month – another slight increase from 12 in the last quarter. Those SMEs who already trade internationally are trading more and making higher value transactions, suggesting a change in sentiment towards international business. The number of SMEs exporting stayed the same over the last two quarters (31%), but there has been a slight pickup in number of SMEs importing goods from 24% in Q4 2017 to 26% in Q1 2018. This may be down to the improvement in GBP making imports more cost effective compared to last year. 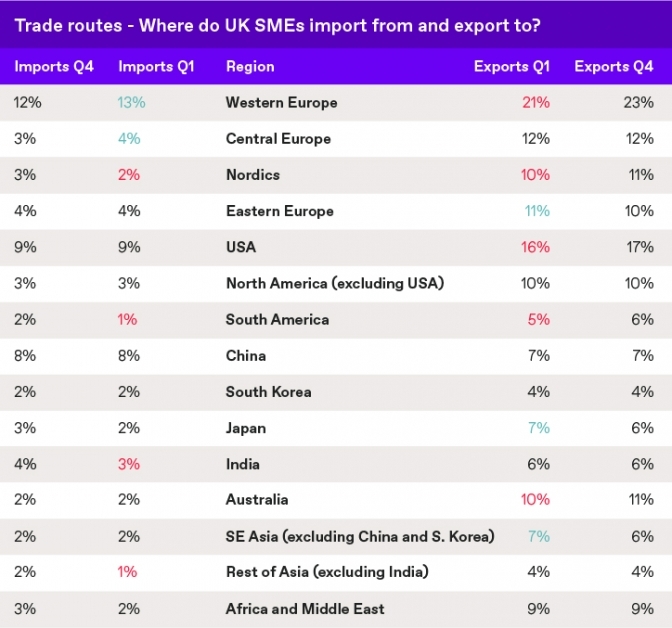 UK SMEs continue to choose the US, Western and Central Europe as their main trading partners, with one in five SMEs exporting to Western Europe and one in six to the US. 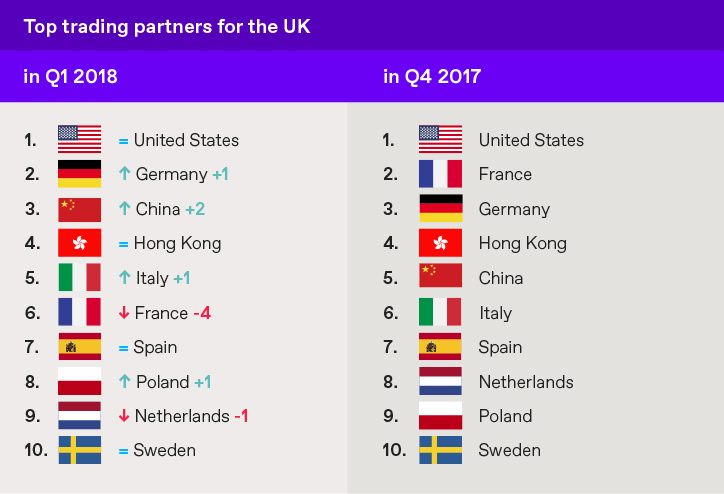 WorldFirst’s own client data shows the US remains the UK’s top trading partner with 12% of all international payments made there. Germany comes second and China takes third place. France drops down by four points showing less dependence on the EU for international trade as SMEs increasingly look to the US and Far East for trade. 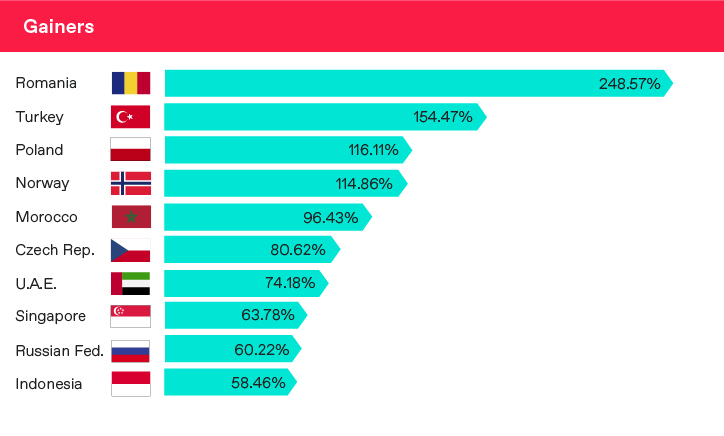 Turkey and Poland continue to cement their status as emerging hotspots for trading, with both countries experiencing over a 100% increase in payment flows this quarter having been in the top ten gainers for the past three quarters. Eastern Europe in general continues to offer opportunities for trade with half of the top ten gainers in the table hailing from the Eastern bloc. In another sign of the pick-up in trading, only seven regions experienced a decline in payments from UK SMEs. Most of these were traditional UK trading partners including Malta, France and Hong Kong, indicating that small businesses are looking to new, ambitious markets for international growth. For the first time in a year, there was a rise in senior decision makers at UK SMEs expecting to grow their business over the next quarter. 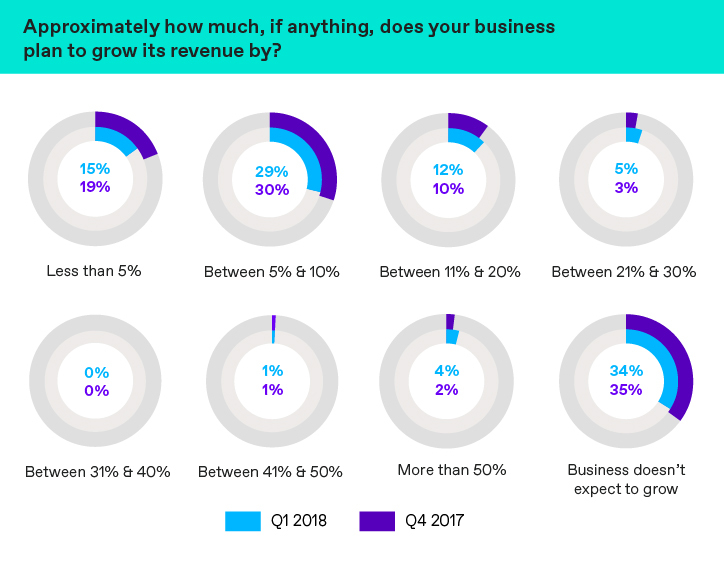 Two thirds of businesses expect to experience some revenue growth in the coming months, while over half (51%) expect growth of over 5% specifically. 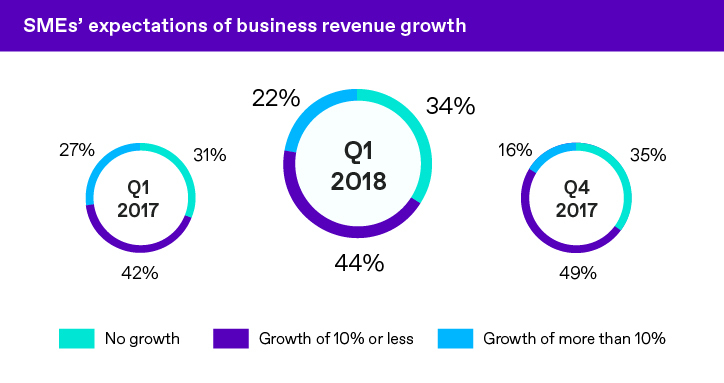 Only 34% of decision makers do not expect any growth, a 1% decline from the last quarter and a 4% rise from the same period last year. 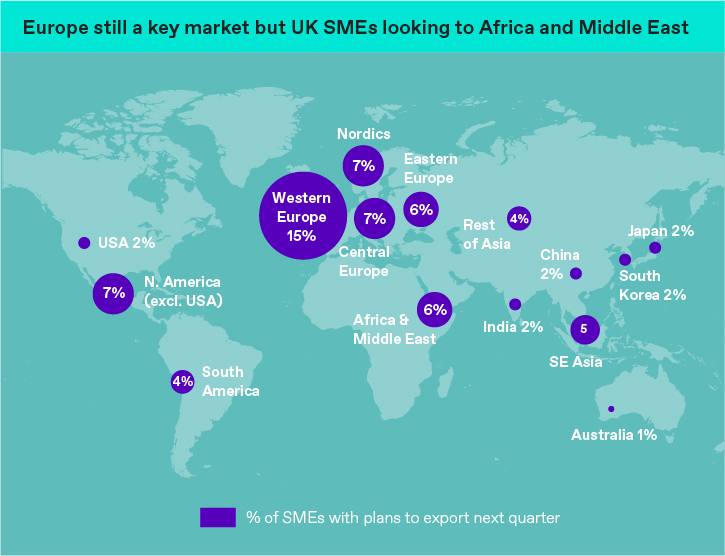 With more SMEs expecting to grow internationally over the next quarter, Europe, Africa and the Middle East are the key regions being considered for export opportunities. When asked what would make SMEs increase their exporting activity, 37% revealed a willingness to export more over the next year but many wanted external help to do so. 17% of businesses revealed they would export more if they received additional support from the UK government, while 18% wanted help identifying international business partners. 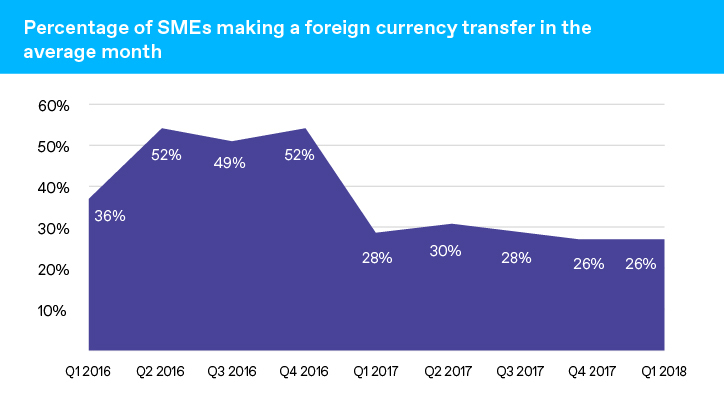 SMEs are feeling confident about international trade and with sterling making significant improvements in Q1, more SMEs have been willing to make foreign transactions and book currency deals over the last quarter. 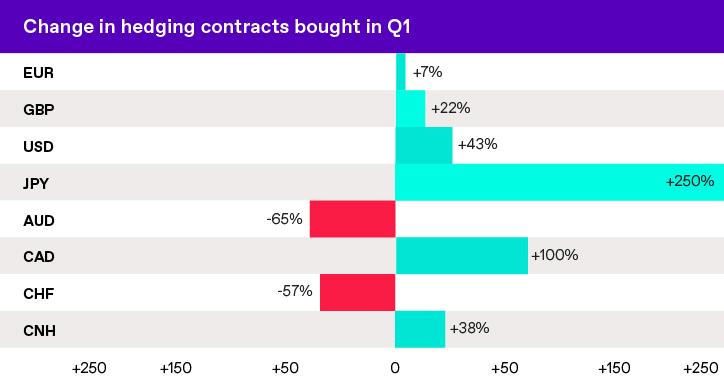 In another sign that SMEs are preparing to make more foreign transactions over the next few months, hedging contracts amongst six of the eight most traded currencies increased in Q1 2018. Contracts booked to hedge against the Japanese Yen and Canadian Dollar grew significantly, experiencing an increase of 250% and 100% respectively. The only declines were seen against the Australian Dollar and Swiss Franc, both of which experienced a volatile Q1. The SME sentiment tracker: What’s affecting global trade? Whilst SMEs sentiment towards Brexit remains divided, fewer small businesses than ever are worried about the impact of leaving the EU. Though the balance still tips in the favour of those who are concerned (45% compared to 41%), the trend shows that more and more are starting to look beyond Brexit. 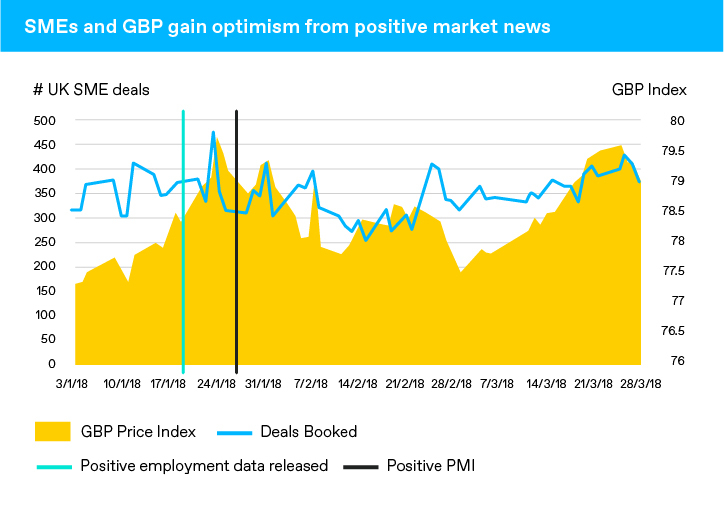 Nonetheless, there is significant divergence across industries, with 63% of decision makers in the manufacturing sector worried about the impact of Brexit. This may be down to the sector feeling the effect of currency fluctuations more than others given the nature of these businesses. 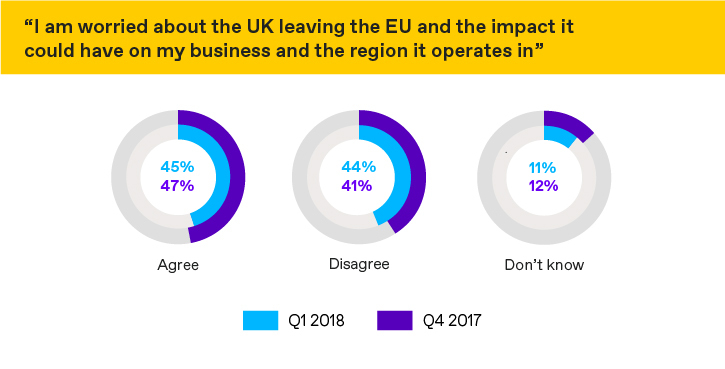 Despite a lot of the talk around the impact of the UK leaving the EU being focussed on the financial sector, only 26% of decision makers in financial services businesses were worried about it, whilst over half disagreed with the statement entirely. Positivity about trading conditions is also reflected in attitudes towards currency volatility. 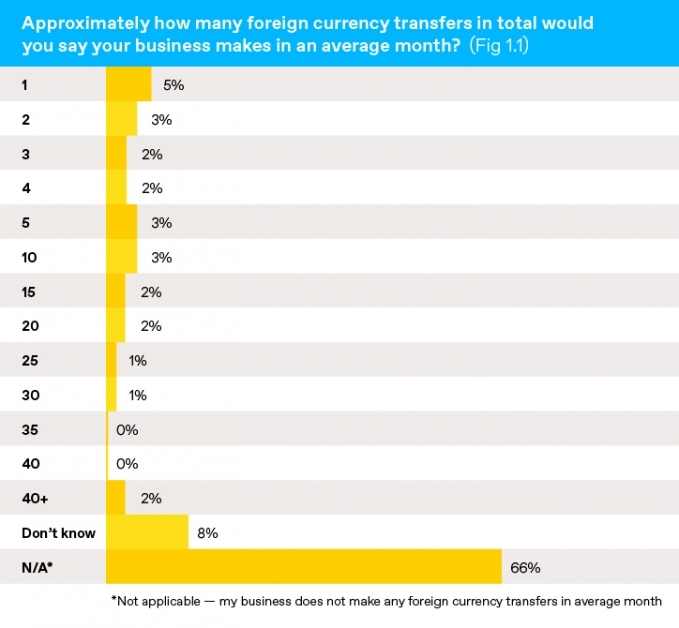 Only 28% of decision makers were worried about currency volatility and the impact it could have on their business. This is down from 37% in the previous quarter, showing currency volatility is having less of an impact than previously experienced. 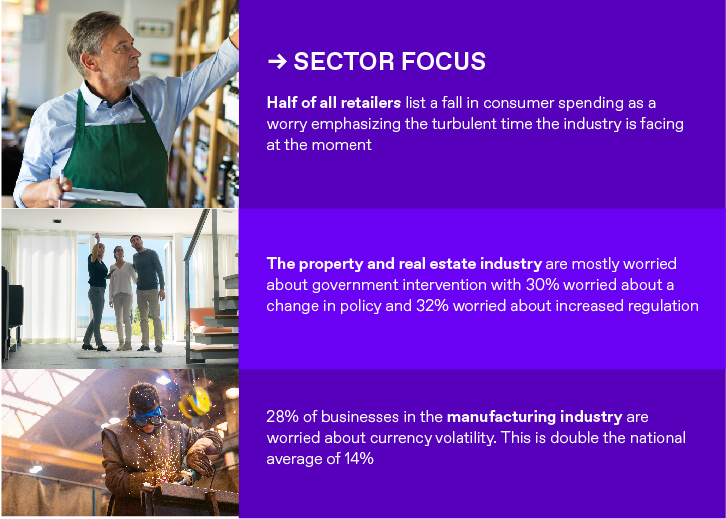 A fall in consumer spending continues to be the biggest worry for most businesses with 22% of decision makers worried about the impact it could have on their business. Fewer SMEs are now worried about the potential for a rise in inflation or currency volatility – the biggest worries for these businesses in 2017. Overall, there were declines across most other issues demonstrating further confidence from UK SMEs. All figures, unless otherwise stated, are from YouGov Plc. Total sample size was 1071 senior decision makers in small/ medium British businesses. Fieldwork was undertaken between 3rd-11th April 2018. The survey was carried out online. The figures have been weighted and are representative of all British business sizes. WorldFirst data on client contracts was collated between 1st January 2018 and 31st March 2018 and refers to UK corporate desk clients only. We’re WorldFirst, experts in moving money around the world. As a fast growing FinTech business, we specialise in making foreign exchange simple, fast and fuss free for people and businesses with global ambitions. By combining best in-class technology with award-winning customer service, we’ve helped over 160,000 people, small businesses and online sellers transfer over £70bn since 2004. Our clients never stop. And neither do we. We operate all over the world and have over 600 employees based in 7 offices across London, Amsterdam, Austin, Hong Kong, Singapore, Sydney and Tokyo.